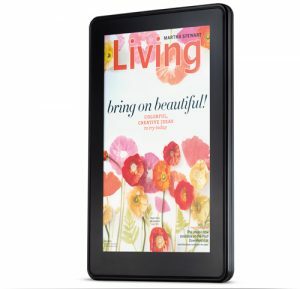 Online retailer Amazon on Wednesday officially launched its first Android tablet, the 7" Kindle Fire. Taking its name from the company's already successful line of e-readers, the Kindle Fire introduces a handful of new features to the Android tablet business. First, it will enter the market at the low end of the pricing scale. At $199, it will cost the same as Lenovo's Ideapad A1 tablet, putting it far below other brand name tablets in price. Second, Amazon's major differentiator is that it has built its own UI on top of Android that completely focuses on a user's existent Amazon account and all of Amazon's services: its MP3 shop, its Android App Store, the Kindle reader app and bookstore, Amazon Video on Demand and Amazon Prime. Amazon CEO Jeff Bezos today said the Kindle ships pre-registered with your Amazon account and will work immediately out of the box. When comparing this to the setup currently related to Apple's iPad or even other Android tablets, it's a major winning factor. Third, and probably the most surprising revelation from Amazon today was Amazon Silk, a cloud-supported browser which resides locally on the Kindle Fire, but utilizes Amazon's EC2 for handling heavy computation. The user can split computational tasks between the onboard dual-core processor and Amazon's EC2 cloud. This is a big deal, and one that we're going to dive into much more deeply today.